NATIONAL ARTS MONTH. They say that Filipinos are generally expressive. This expressive nature of Filipinos is celebrated in February during the commemoration of the EDSA People Power Revolution and in various activities held during the month-long National Arts Month. In 1986, Filipinos openly expressed their common desire to overthrow years of dictatorship rule. Since then, the nation celebrates this historic event as the EDSA People Power Revolution every 25th of February. A few years after EDSA, a presidential decree has been proclaimed making February the National Arts Month to showcase various artistic expressions of Filipino artists through music, dance, painting, sculpture, theater, and other creative forms. On one weekend in February we were back in Angono, Rizal for the Philippine Visual Arts Festival. PVAF is the visual arts component of National Arts Month. Fittingly, the town of Angono has played host for this five-day festival dubbed as the Rizal Experience. ART CAPITAL. Hailed as Art Capital of the Philippines, Angono has been popularly known as the cradle of the artistic abilities and creative expressions. For one thing, this lakeshore town has produced two National Artists; Lucio San Pedro for music and Carlos Botong Francisco for painting. But even before Maestro San Pedro’s lullabies and Botong’s murals have gained national recognition, the unique artistic talent of a painter of religious icons known as Tandang Juancho (Juan Senson) has already made Angono famous for its artistic traditions during the 19th century. ANGONO PERTROGLYPHS. Predating the artworks of Tandang Juancho are the Angono Petroglyphs. Discovered by Botong in the 1960s, these rock carvings in Layang-Layang Cave are the oldest artworks in the Philippines dating back to 3000 BC. Angono’s long history of artistic expression inspired contemporary artists Nemi Miranda Jr., the late Perdigon Vocalan and Jose Blanco, the artists collectively known as the Angono Ateliers and the Neo-Angono Arts Collective to continue the artistic legacies of the pre-historic artists and masters like Tandang Juancho, San Perdo, and Botong. HIGANTES. That five-day art festival highlighted Angono as the country’s art capital. It began with the Higantes Parade at the town center. The parade of colorful effigies made of bamboo, cloth, and papier mache, started as form of protest from the people when Angono was still dominated by a stingy landlord who prohibited merrymaking except during the feast day of the town’s patron saint. HUMAN CORDON. The Higantes Festival brings to mind that even before the 1986 EDSA People Power, the town folks of Angono have already staged a political protest through nonviolent and creative means. 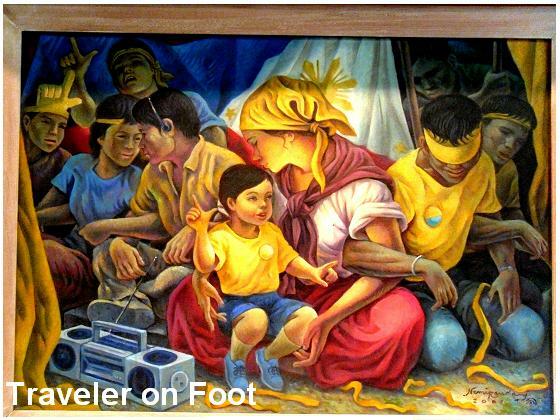 That February 1986 peaceful protest is captured in the Human Cordon painting of Angono artist Nemi Miranda which depicts a Filipino family in People Power protest. One of the main events of the festival is the special handover ceremony for the Human Cordon painting to the president of the Philippines. KONTRA-GAPI. 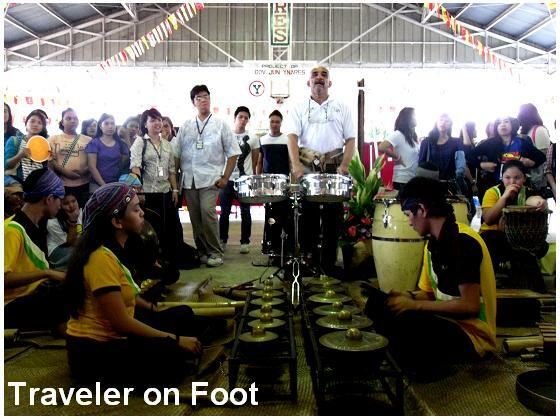 On the second day of the festival, music and dance were performed by the Kontemporaryong Gamelan Pilipino aka Kontra-Gapi. Led by U.P. Professor Edru Abraham, this ensemble uses indigenous Filipino instruments like the Maranao kulintang, Cordillera flat gongs called the gangsa, and a variety of wind instruments and xylophones made of bamboo to produce mesmerizing music. So mesmerizing was their music that after the group’s performance the audience tried out each musical instrument and attempted to produce harmony. TRADISYON AT INOBASYON. While Kontr-Gapi sets the mood for the festival day through their music, artists-delegates from different regions in the country participated in the interaction mural painting. The inspiration of the murals coincided with the festival theme of Tradisyon at Inobasyon. EPILOGUE. Completing the Rizal Experience, the delegates and visitors were led to museum and galleries around Angono like the Nemiranda Arthouse, Blanco Museum, Ang Nuno Gallery, 2nd Gallery, Atelier Gallery, Petroglyphs Museum, and Pinto Art Museum in Antipolo. We recently walked into the Nemiranda Arthouse to meet for the first time the artist who has been instrumental in making Angono a household name in Philippine Art. Nemesio Miranda Jr., popularly known in the art circle as Nemiranda, is a highly figurative artist who stands out in the dynamics of realism. One does not need to be an art critic to appreciate Nemiranda’s works. A common person can be impressed by his mural at the EDSA Shrine, the 20 relief sculpture of the Mysteries of the Holy Rosary along the road to Antipolo Church, and monumental sculptures and stunningly beautiful paintings at his home-studio in Angono. The same exciting feeling as with our visits to Angono a couple of years ago, we remain in awe at the larger than life sirena that arches above the entrance of the art gallery. This glaring sculptural monument is repeated at the Nemiranda Arthouse in Doña Justa Subdivision and at the defunct Nemiranda Café located along Angono’s main highway. In the language of the paintings and sculptures we saw in the Nemiranda Arthouse it tells a fascinating story of Angono’s mystic charm and our country’s timeless legends and traditions seen through the eyes of Nemiranda, the storyteller. But for us, nothing can be more engaging than having to learn about Nemiranda’s journey as an artist and his views about Philippine art but from the artist himself. A graduate of Fine Arts at the University of Santo Tomas, Nemiranda has worked for years, partnering with architects to do monumental sculptures and mural paintings capturing scene depicting local folklore and Filipiniana themes and forms. This projects enabled him to support his family at the same time pursue his art. As a painter, he is a master of imaginative figurism or drawing the human form from pure imagination. A veteran of numerous art exhibits, locally and abroad, his favorite subjects are women in mythical characters and families in pastoral scenes. As a member of his community, Nemiranda has contributed in promoting Angono’s rich heritage such as the Higantes Festival and fluvial procession dedicated to Angono’s patron saint, San Clemente. Putting up the Nemiranda Arthouse is part of his mission in nurturing the artistic consciousness not just for the people in Angono but for all Filipinos as well. For years, the arthouse has begun workshops and events designed to inspire the youth who by talking to the artist and watching Nemiranda go through the creative process, might see how an idea can grow into a finished work of art. 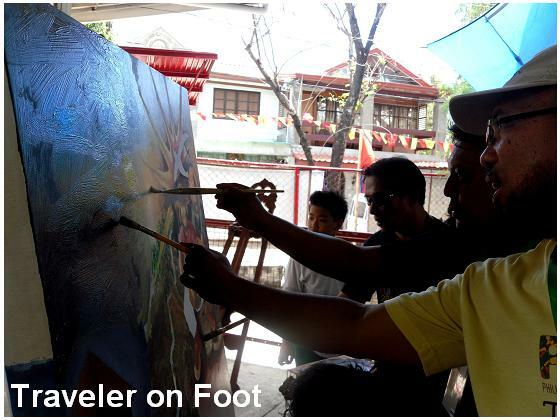 Sharing his painting techniques and allowing people to watch him work is never a problem with Nemiranda. For him, no one can duplicate an artist’s work. In fact, an artist must teach those who have the talent and inspire them to create works of art. Angono gained the sobriquet as the Art Capital of the Philippines since a number of highly acclaimed artists and musicians including two National Artists, maestro Lucio San Pedro and painter Carlos Botong Francisco hailed from this lakeshore town. 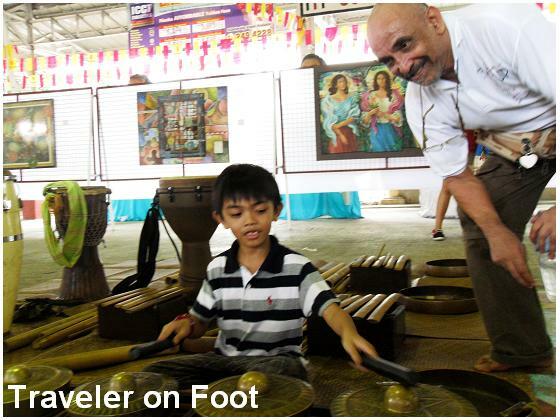 A disciple of Botong is Nemesio Miranda Jr. who is popularly known in the art circle as Nemiranda. In 2008, we visited the Nemiranda ArtHouse and wowed at the creations of Nemi including the larger-than-life sirena that arches above the entrance of the art gallery. This glaring structural artwork is repeated in some parts of the home-studio as well as in the Nemiranda Café and Restaurant located along the town’s main road. At the Nemiranda Café, good food is complemented by paintings of mythical creatures, nature goddesses, mother and child sketches all created by the venerable artist along with artworks by his children and fellow artists from Rizal. While Nemi continues to capture his home town’s mystic charm in his artworks, the creative architecture of the Nemiranda Café along Angono’s national highway continues to tell passers by that they are now in the Art Capital of the Philippines.